�Social welfare� organizations are not required to disclose the identity of their donors. However, the tax code clearly states that such organizations may not have political activity as their primary purpose. Consider Karl Rove�s Crossroads GPS. If you say you believe that political activity is not their primary purpose, please contact me about a magnificent bridge that I would love to sell you. The optimism within me says that all these Pubs will get their just dues, Hoping it will be sooner than later. From the New York Times � in response to Jabber Jowls McConnell's op-ed piece "�as his explanation of why the Disclose Act, which would end the practice of secret political donations, is �un-American� and an attempt to limit free speech." � There's that Citizens United ruling wagging it finger again! A sure sign that if JJ McConnell is getting all puffed up, it is the right place to be. I hope Terry Lemons doesn't live up to his name � being a lemon on the IRS investigation. The IRS MUST do an independent investigation of these 'social welfare' (using that term almost makes me want to hurl when used in association with Rove and company) groups that flaunt the law. Corporations are not people AND money is not free speech! Vote Democratic 2012!!!!! Vote Obama/Biden 2012!!!!! I hope the act passes. I am forwarding this to friends and sharing it on Facebook. It appears that the IRS is going to have to hire a lot more people in the not-too-distant future! With their involvement in the Affordable Care Act and having to increase its scrutiny of tax-exempt political organizations, a lot of jobs will have to be created. I like that picture of Karl Rove --because he appears to be wearing an orange prison jumpsuit. Being forced to wear prison uniforms with the "Cisco" label instead of expensive suits with the "Armani" label is just what this arrogant jerk deserves! When he finally ends up behind bars, I hope that Georgie's "turd blossom" is treated with the same level of respect he was willing to extend to anyone who wasn't a member of his inner circle. He is one corrupt, conniving, cruel and heartless man! the day slowly approaches that will see them all off to prison.....I can feel it in my bones. Speaking of taxes, why aren't the Democrats giving it to Rmoney about his overseas bank accounts? I mean, they can bury any of his hopes for a win in any political office so easily! Seriously, the only reason for Swiss accounts is to seek the tax loophole, i.e., to evade US taxes. In other words, Rmoney not only pays less taxes than those of us who make far far less than he does, but that's not enough for him. He has to hide his money in banks in other countries to evade paying his not-even-close-to-fair taxes here. So, in other words, he is talking up this storm about "being a businessman" that basically translates into "I know how to take advantage of the law because I hide my money, so that when I become president, I will continue to evade taxes and I will take the shirt off your back too....send your job overseas, cut teacher's salaries and fire them (who needs to fund schools? Dumb people are FOX viewers for heaven's sakes!) because I believe in making money and keeping it ALL for myself because it is never enough for me"
VOTE OBAMA 2012!!!!!!!!!!!!!!!!!!!!!!!!! and Democrats down the party line, baby! Thanks for including the link to support the Disclose Act. Signed. Thanks all. Of course the Disclose Act will not survive a Republican filibuster in the Senate, but maybe the IRS will help. Signed, shared & noted. Thanks for posting, Tom. Well, the IRS got Capone many, many decades ago...we can only hope they're funded well for this task. 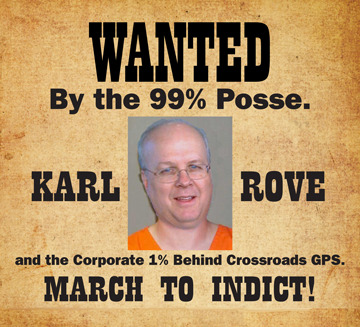 Rove should only be 1st on a very long list! So agree with you all. Doesn't matter who you vote for though they will put in office whoever they want there. Blessings to all who care about our country and the real people here. Thanks Tom I signed the disclose act, I would love to see all these crooks locked up.